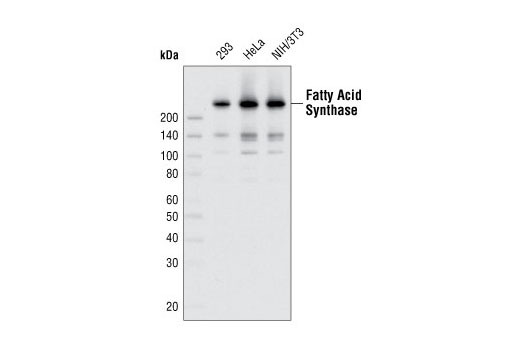 Fatty Acid Synthase (C20G5) Rabbit mAb detects endogenous levels of total fatty acid synthase protein. 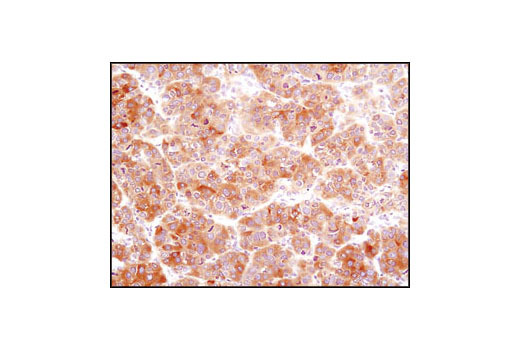 Fatty Acid Synthase (C20G5) Rabbit mAb is produced by immunizing rabbits with a synthetic peptide around Gly46 corresponding to the sequence of human fatty acid synthase. Fatty acid synthase (FASN) catalyzes the synthesis of long-chain fatty acids from acetyl-CoA and malonyl-CoA. 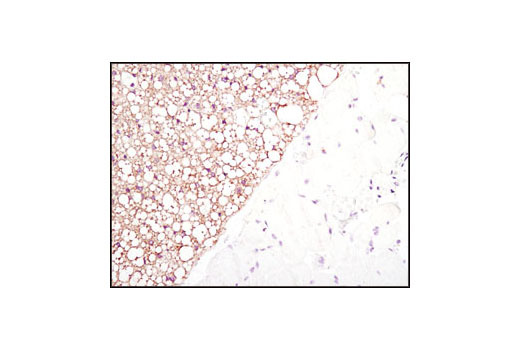 FASN is active as a homodimer with seven different catalytic activities and produces lipids in the liver for export to metabolically active tissues or storage in adipose tissue. 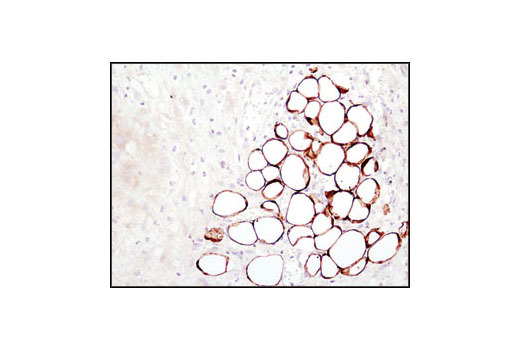 In most other human tissues, FASN is minimally expressed since they rely on circulating fatty acids for new structural lipid synthesis (1). 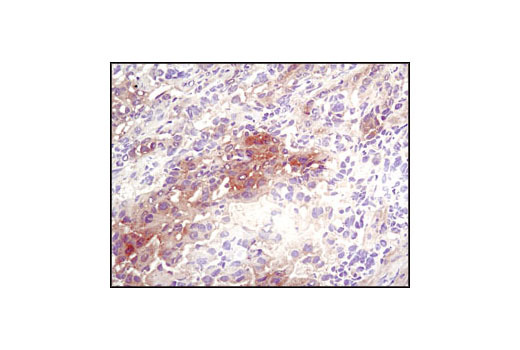 According to the research literature, increased expression of FASN has emerged as a phenotype common to most human carcinomas. 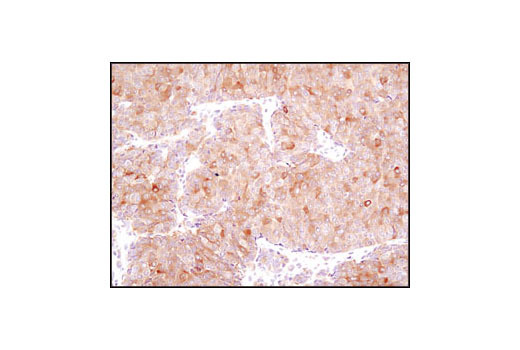 For example in breast cancer, immunohistochemical staining showed that the levels of FASN are directly related to the size of breast tumors (2). 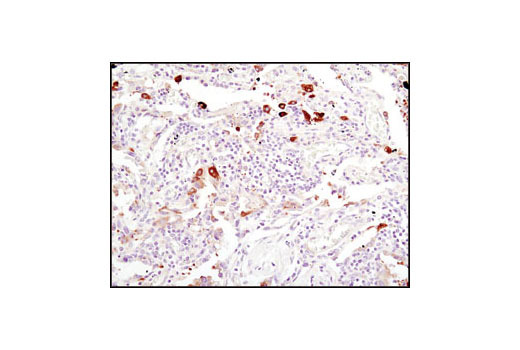 Research studies also showed that FASN is highly expressed in lung and prostate cancers and that FASN expression is an indicator of poor prognosis in breast and prostate cancer (3-5). 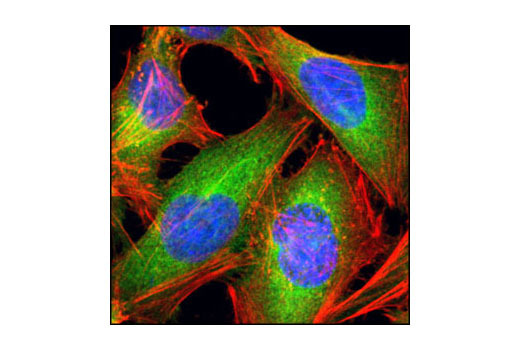 Furthermore, inhibition of FASN is selectively cytotoxic to human cancer cells (5). Thus, increased interest has focused on FASN as a potential target for the diagnosis and treatment of cancer as well as metabolic syndrome (6,7). Wells, W.A. et al. (2006) Breast Cancer Res Treat 98, 231-40. Kawamura, T. et al. (2005) Pathobiology 72, 233-240. Shah, U.S. et al. (2006) Hum Pathol 37, 401-409. Kuhajda, F.P. (2000) Nutrition 16, 202-8. Tian, W.X. (2006) Curr Med Chem 13, 967-977. Kusunoki, J. et al. (2006) Endocrine 29, 91-100.